Starting a relationship can seem stressful enough after a divorce. After all, you’re hoping it will be right, and you’re constantly checking yourself to make sure you’re doing the right things. It’s much harder if you have children, since you obviously put them first, so that new relationship you’re trying to get off the ground has to fit in around them – and they have to like your new partner or it’s really not going to work out. But try doubling that problem – what if both you and your partner have kids? How do you work that out? These days it’s as likely to happen as not, and it can become very tangled, especially if you both have children living with you, or your new partner has children every weekend or so. What’s the divorce advice on that? How do you manage those problems? Probably the first and most important piece of advice is to not introduce a potential partner to your children until the relationship is established – and the same goes for not meeting the other person’s children either. Most divorce advice will tell you that you need time alone at first to get your relationship off to a good start and create a bond between you. The introduction of kids should be gradual – and not when your partner is staying the night, for instance. 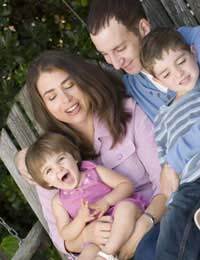 If the other person is a parent, they’ll interact more easily with children, but give both sides time to warm to each other. The same applies when you meet your partner’s children. Don’t try and be a parent to them. They already have two parents and don’t need another – just be yourself. Give them time to get to know you, and for you to know them. Once you’re established with the other person’s kids and they with you, the next step is to get all the kids together, and see how they get along. If the ages are very similar, that’s a plus, especially if you can start with something like a picnic or a party, an event of some kind. Assuming they all get on well – which no one can really predict – things are moving ahead. But there are still problems to be faced, as good divorce advice will tell you. Your relationship is important, but your kids are even more important, and the same applies to your partner. You need to spend time with your children and keep them assured they’re the centre of your world, but you also need time alone with your partner – no relationship can grow if the kids are around constantly. Give your kids all the time they need, and juggle your schedule with your partner. If you can both arrange it so your exes have the kids at the same time, then you can have an uninterrupted weekend together. There’s no denying it’s difficult, but as all good divorce advice will tell you, as long as you keep your priorities straight, don’t try and rush things, and make sure you do get quality time with your new partner, there’s no reason why your new relationship can’t flourish.